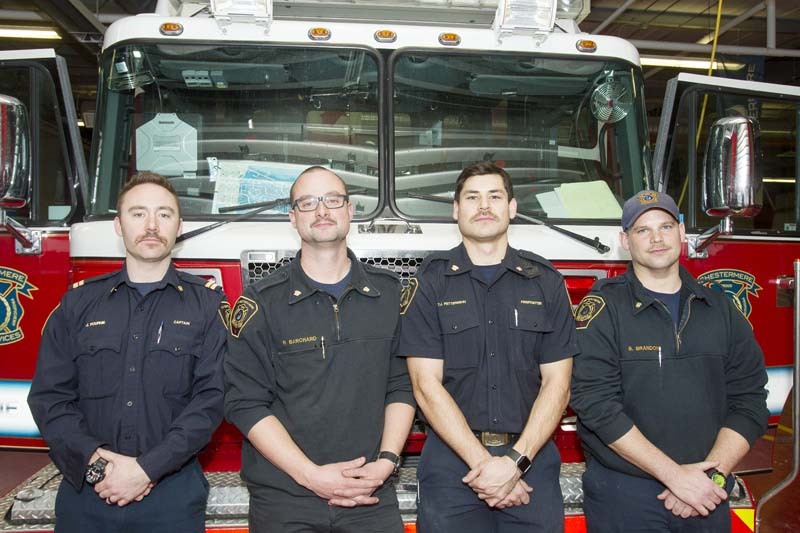 For the members of Chestermere Fire Services (CFS), the scratchy mustaches and recoiling wives and girlfriends are worth it as they grow out their mustaches to raise awareness and money for Movember. “My wife usually donates about $100 but its more for me to shave it off than it is for me to keep it,” said Senior Firefighter Rob Barchard of his mustache. This is Barchard’s ninth year participating in Movember which raises awareness of men’s health issues. The Movember Foundation started out with no shave November to raise awareness for prostate cancer in 2003. It has since grown to support prostate cancer, testicular cancer, and mental health and suicide prevention as part of the broader goal of stopping men from dying too young. Barchard said that the work of the Movember Foundation hits home for the fire service in general. “The mental health thing is big for us,” he said. It’s for this reason so many members of CFS are growing, often bad, mustaches this month. Barchard estimates that between 75 and 80 per cent of the service are growing out their mustaches for Movember. “The two newest guys have to do it, they have no choice, and then everybody else volunteered to do it,” he said. The support goes from top to bottom in the department with even Fire Chief Brian Pomrenke growing a mustache. For the few firefighters that aren’t participating, they tend to be on the receiving end of some ribbing for choosing to opt out. Although, Capt. Brent Paquette, who always has a mustache, hasn’t been made to shave and start over for Movember. “His is too majestic to shave,” said Barchard. Discounting Capt. Paquette, Barchard nominates his own Captain, Joel Fournie, as having grown the best Movember ‘stache. “I would define it as a structural mustache, it is so thick,” said Barchard. On the other end of the spectrum, Barchard said that over the years there have been some pretty bad mustaches grown by members. This year he thinks that Firefighter Jeremy Vitale has the worst mustache. “Jeremy…grows a very blonde, unvisible mustache,” said Barchard. The varying quality of mustaches grown is part of the fun of the campaign for the firefighters. “I have a bad mustache,” admits Barchard. “Everybody’s got their own little thing…there’s a lot of ribbing going on,” he said. The most frequent targets though are the guys who’ve decided not to participate. “The couple of guys that don’t usually get the gears, which is kind of funny,” said Barchard. Jokes aside, raising awareness of men’s health through Movember is very important to Barchard. “Both my mom and my dad have had reproductive cancers and lived,” he said. Barchard said that his parents were able to survive cancer in part because of the research funded by organizations like the Movember Foundation. At this point, Barchard believes that Movember is well known for men growing mustaches but thinks that the health awareness still needs to grow, which is why the department is focused more on awareness than fundraising this year. “It’s just very easy to look around through November and see, strange, weird looking mustaches on peoples’ faces and say you’re doing Movember,” said Barchard. He hopes that those weird mustaches are starting conversations or getting people to go to the Movember Foundation’s website to learn about Men’s health and what Movember means. To learn more or to make a donation in support of the CFS members Movember campaign go to https://moteam.co/chestermere-fire-stache-masters.